Regular readers of The Book Chook blog may have noticed that I get excited about books and ideas that support kid's literacy. Well, I'M EXCITED! Some like-minded bloggers and I got together and created our own blog log. 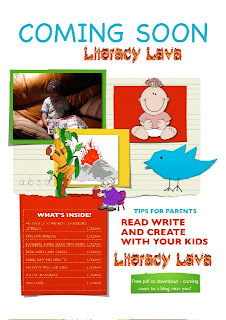 It's called Literacy Lava, and it's a digital magazine (in pdf format) that you'll be able to download and use, share with others, or print and keep. The contributors are bloggers and parents who are passionate about children's literacy. This first issue is erupting with great tips for parents and suggestions for literacy activities to share with kids. You'll want to catch the first issue of Literacy Lava, coming soon! I foudn you through the home teacher can't wait to see waht the literacy lava is all about! I have a 2 blogs but one is just about childrens books and activities you can do with them! I'm proud to be a part of Literacy Lava! You have put so much time, effort, and passion into this. I can't wait to see the first issue! Recent blog post: Literacy Lava Newsletter is Coming Soon! Hi bookworm! Is the "home teacher" our Amy? I love the sound of Tanka Tanka Skunk. And the price tag is great too! Oh I am so excited! Literacy Lava is a phenomenal idea! I can't wait to read it! Can you tell I'm excited! Recent blog post: TSS: New, New, New! Yay Rebecca! I'm really looking forward to your feedback on it! Recent blog post: What's the Deal with Online Publishing?